It has come to our notice that the names of the Academy Journals are being misused and fraudulent emails are being sent inviting submissions to online predatory journals with the same titles. These email addresses are general ones like gmail, and not from an institutional domain. The emails coming from the Academy will be from the domain "ias.ac.in". Please do not respond to requests coming from other email IDS as we at the Academy do not use gmail or any another mail server. The Journal of Biosciences began in 1934 as a part of the Proceedings of the Indian Academy of Sciences – Section B until it was split in 1978 from Proceedings – Section B to become Proceedings – Animal Sciences, Proceedings – Plant Sciences and Proceedings – Experimental Biology. In 1979 Proceedings -- Experimental Biology was named Journal of Biosciences. In 1991, Animal Sciences and Plant Sciences merged with experimental Biology to comprise one journal and retained the name Journal of Biosciences. 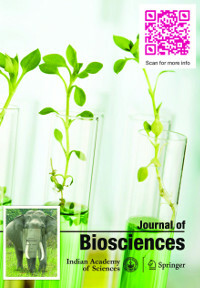 The journal covers all areas of biology and is considered the premier journal in the country within its scope. It publishes research and reviews, series articles, perspectives, clipboards, commentaries, and short communications. Special theme issues are also published. Journal of Biosciences is now distributed in print outside India and online worldwide by Springer, co-publisher of the journal together with the Indian Academy of Sciences. On Springer, Journal of Biosciences (www.springer.com/12038) is part of SpringerLink, one of the world's leading interactive databases of high quality STM journals, book series, books, reference works and online archives collection. Print subscriptions within India and open online access will continue to be served from Indian Academy of Sciences.